NAIROBI, Kenya (AP) — The Sept. 21 terrorist attack on Nairobi’s Westgate Mall produced a raft of questions that haven’t always had clear, complete answers. The answers to some questions about the attack have changed over time. Other questions haven’t yet been fully answered. How many attackers were there? How many hostages? Were there any hostages at all? The Associated Press attempts to define what is known and not known about the deadly mall attack. Read the full AP article as it appeared at Bloomberg Businessweek. NAIROBI, Kenya (AP) — When Ohio resident Bill Haynes heard about the shooting at Westgate Mall by Islamic extremist gunmen last month, he considered canceling his upcoming 17-day safari to Kenya and Tanzania. Acting on advice from a friend in Nairobi, Haynes went through with his trip except for a stop at Lamu, a coastal city near Somalia where a French woman was kidnapped in 2011. The risk to tourism was one of the first concerns officials expressed after the attack that left at least 67 dead including 18 foreigners. 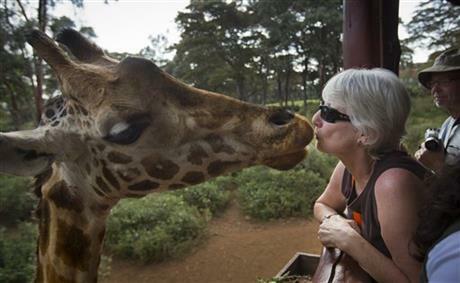 Tourism generates 14 percent of Kenya’s GDP and employs 12 percent of its workforce, according to Moody’s Investment Services and the World Travel and Tourism Council. Moody’s predicts the attack will cost Kenya’s economy $200 million to $250 million in lost tourism revenue, estimating it will slow growth of Kenya’s GDP by 0.5 percent. Kenya’s 2012 GDP was $41 billion. Read the full story as it appeared at the Associated Press. NAIROBI, Kenya (AP) — After almost a week, there is no precise death toll, no word on the fate of dozens still missing and no details on the al-Qaida-linked terrorists who attacked Nairobi’s most upscale mall. As al-Shabab militants struck two Kenyan border towns and threatened more violence, relatives of the mall victims wept outside the city morgue Thursday, frustrated by the lack of information and a holdup in the release of bodies of the victims. Roy Sam, whose brother, 33-year-old Thomas Ogala, was killed, said he had been going to the morgue since Monday, but workers there had not prepared his brother’s body, which was mangled by a close-range gunshot wound to the head – an apparent execution. “They said they were going to prepare the body to make it look nice, but we came back the next day and the next, and it wasn’t any different,” Sam said. The morgue superintendent, Sammy Nyongesa Jacob, said workers were told not to touch the bodies until post-mortuary studies had been completed. Kenya’s chief pathologist, Johansen Oduor, said his team was removing bullets and shrapnel from victims to find out exactly how they were killed, then handing them over to police as evidence. He refused to reveal how many bodies were in the morgue but said he was told to expect more – though he would not say how many. It was the largest terrorist attack in Kenya since the 1998 bombing of the U.S. Embassy, and FBI agents were dispatched to do fingerprint, DNA and ballistic analysis on the bodies. PORT-AU-PRINCE, Haiti—The Haiti reconstruction panel co-chaired by former U.S. President Bill Clinton announced a major new project Wednesday to rebuild part of the capital damaged by last year’s earthquake. “This kind of collaboration will generate the lasting change, the permanent housing solutions that Haitians are depending on,” Clinton said in a speech after the commission’s announcement. Click HERE to read the full AP story as it appeared at the Boston Globe. JIMANI, Dominican Republic – The Dominican Republic has deported thousands of illegal immigrants in recent weeks, sowing fear among Haitians living in the country and prompting accusations its government is using a cholera outbreak as a pretext for a crackdown. In the largest campaign in years to target Haitians living illegally in the Dominican Republic, soldiers and immigration agents have been setting up checkpoints and conducting neighborhood sweeps, detaining anyone without papers and booting them from the country. Click HERE to read the full AP story as it appeared at the San Diego Union-Tribune. PORT-AU-PRINCE, Haiti – Former Haitian dictator Jean-Claude “BabyDoc” Duvalier ensconced himself Monday in a high-end hotel following his surprise return to a country deep in crisis, leaving many to wonder if the once-feared strongman will prompt renewed conflict in the midst of a political stalemate. Duvalier met with allies inside the hotel in the hills above downtown Port-au-Prince and spoke publicly only through emissaries, who gave vague explanations for his sudden and mysterious appearance — nearly 25 years after he was forced into exile by a popular uprising against his brutal regime. Henry Robert Sterlin, a former ambassador who said he was speaking on behalf of Duvalier, portrayed the 59-year-old former “president for life,” as merely a concerned elder statesmen who wanted to see the effects of the devastating Jan. 12, 2010, earthquake on his homeland. Duvalier — who assumed power in 1971 at age 19 following the death of his father, Francois “Papa Doc” Duvalier — still has some support in Haiti and millions are too young to remember life under his dictatorship. But his abrupt return Sunday still sent shock waves through the country, with some fearing that his presence will bring back the extreme polarization, and political violence, of the past. Click HERE to read the full AP story as it appeared at Yahoo! News. PORT-AU-PRINCE, Haiti (AP)- Frustrated presidential candidates led a march through Haiti’s capital Thursday to demand officials annul an election they say was tainted by fraud. “These were not elections. People were not allowed to vote and there was stuffing of the election boxes … We need democratic elections,” candidate Charles Henri-Baker, a factory owner, told The Associated Press. The presidential hopefuls were part of a group of 12 candidates who called for voting to be canceled while polls were open, alleging the election was rigged in favor of Celestin. Click HERE to read the full Associated Press story as it appeared at the Star Tribune. LEOGANE, Haiti – Hurricane Tomas flooded the earthquake-shattered remains of a Haitian town on Friday, forcing families who had already lost their homes in one disaster to flee another. In the country’s capital, quake refugees resisted calls to abandon flimsy tarp and tent camps. “We got flooded out and we’re just waiting for the storm to pass. There’s nothing we can do,” said Johnny Joseph, a 20-year-old resident. The growing hurricane with 75 mph (120 kph) winds battered the western tip of Haiti’s southern peninsula and the cities of Jeremie and Les Cayes. At least three people died trying to cross swollen rivers, Haiti civil protection officials said. The hurricane had earlier killed at least 14 people in the eastern Caribbean. Click HERE to read the full Associated Press article as it appeared at the Boston Globe.